The Federal Aviation Administration (FAA) has prepared an Environmental Assessment (EA) for proposed Area Navigation (RNAV) and Required Navigation Performance (RNP) procedures in the Houston Metropolitan Area. The FAA issued a Finding of No Significant Impact and Record of Decision (FONSI-ROD) for the project on June 13, 2013. Please use the navigation bar on left to learn important information about the EA and FONSI-ROD, which are available here, including related documents, project schedule and FAA contact information. The Houston OAPM project would improve the efficiency of the national airspace system in the Houston metroplex by optimizing aircraft arrival and departure procedures at a number of airports, including George Bush Intercontinental Airport (IAH) and William P. Hobby Airport (HOU). The project would involve changes in aircraft flight paths and altitudes in certain areas, but would not require any ground disturbance or increase the number of aircraft operations within southeast Texas airspace. 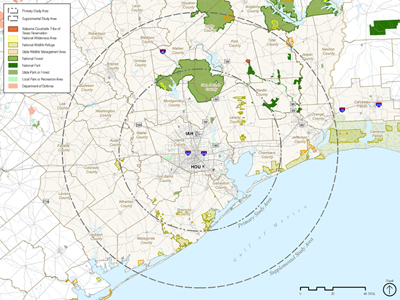 To evaluate potential environmental impacts of the Houston OAPM project, the FAA has established a Primary Study Area, consisting of the area within a 50 nautical mile radius of a point midway between IAH and HOU, to evaluate potential impacts of changes in aircraft routing that are proposed to occur below 10,000 feet above ground level (AGL). The following 19 counties, in part or in whole, are in the Primary Study area: Austin, Brazoria, Chambers, Colorado, Fort Bend, Galveston, Grimes, Hardin, Harris, Jefferson, Liberty, Matagorda, Montgomery, Polk, San Jacinto, Walker, Waller, Washington, and Wharton. The FAA has also established a Supplemental Study Area, consisting of the area within an 85 nautical mile radius of a point midway between IAH and HOU, to assess potential effects of changes in aircraft routing between 10,000 and 18,000 feet AGL. The Supplemental Study Area includes the 19 counties in the Primary Study Area plus an additional 16 Texas counties and two Louisiana parishes (in part or in whole, 35 counties and two parishes total). These include: Angelina, Brazos, Burleson, Fayette, Houston, Jackson, Jasper, Lavaca, Lee, Leon, Madison, Newton, Orange, Robertson, Trinity, Tyler, Calcasieu (Louisiana), Cameron (Louisiana). The graphic below depicts the two study areas. The EA and FONSI-ROD are available here.